It seems almost impossible to open a newspaper's editorial section today without seeing Mark Steyn's byline. Quietly Steyn has become one of the most prolific commentators with regular columns appearing in The National Post, Chicago Sun-Times and the Jerusalem Post, among several other newspapers and magazines and yet surprisingly he's not as well known as other writers. 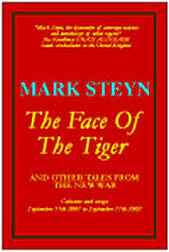 The Face of the Tiger, a collection of Steyn's columns between September 11, 2001 and September 11, 2002, makes the case that he should in fact be one of the best known commentators working today. Concentrating primarily on the world after the September 11 terrorist attacks, The Face of the Tigerspotlights a writer who manages to effectively marry humor and insight, something that many lauded satirists working today regularly fail to pull off. In one of the central essays of the collection, Steyn argues that the "polite fictions" the world trafficked in prior to the attacks were blown apart that day. The world changed that day, shaking America out of its torpor after the end of the Cold War. The new reality was much the same as the old Cold War reality: there is good and there is evil. Western society, with its dedication to liberty and individualism, represents the good while our new enemies, Islamists, fill the role that Communism once played so effectively. Unlike the Soviet Union, however, negotiating with religious fanatics and more secular foes like Saddam Hussein is not an option. Much of Steyn's writings since that terrible morning have seen him try to understand why many of our leaders continue to promote pre-September 11 thinking in this new world. They are, he writes in one essay, "like the passengers on those first three planes; they're thinking he's a rational guy, just play it cool" and all will turn out alright. It's one of those polite fictions that Steyn refers to: the old rules still apply. Instead of September 11 encouraging a new moral clarity about the world, there is good and evil whether the chattering class and Colin Powell will admit it, many still want to believe that the world is swathed in shades of gray. The old rules, like the World Trade Center, collapsed on September 11. "From the moment Colin Powell advised against marching on Baghdad and ended the Gulf War, the world's only superpower has been on a ten-year long weekend off. It loaded up the SUV, went to the mall, enjoyed the good times and deluded itself that the new world of politics could be confined to feel good initiatives -- big government disguised as lots and lots of teensy-weensy bits of small government," he argues. As Steyn repeatedly points out, September 11 forced the United States and the rest of the Western world to take stock of itself. Although the terrorist attacks were ostensibly designed to punish the United States for a number of alleged sins against Islam, they were actually an attack on the West's ideals. For Steyn, the world is divided into two camps: those who saw September 11 as a legitimate judgment of the West by Islamists and those opposed to an alleged American promoted hegemony, and those who saw it as the opening skirmish in a defense of Western ideals. At the danger of engaging in hyperbole, Steyn is an intellectual treasure. The Face of the Tiger is a collection of essays but it is also an exercise in clear-headed rationality. The humorist in Steyn may seek to provoke with occasionally outrageous statements, whether they are on target or not, but the thinker always shines through. Although many writers have recognized since September 11 that the world has changed profoundly, forcing them to jettison some of their dearly held preconceptions, few have illuminated our new era as starkly as Steyn. The Face of the Tiger clearly shows that Steyn not only belongs in the ranks of our best writers, he may very well top the list.